BROWNSVILLE, Texas—In its ongoing commitment to job creation and regional economic growth, the Brownsville Navigation District (BND) Board of Commissioners entered into Memorandum of Understanding (MOU) with the Mission Economic Development Corporation (EDC) to collaborate on international trade opportunities with Mexico and other development projects. Through this alliance, both entities will work to connect and grow business between the Mission Business Park and the Port of Brownsville. $3 billion to the state and more than $2 billion regionally. Mission EDC, a component of the City of Mission, is tasked with creating jobs, attracting capital investment, improving the quality of life and strengthening the workforce in Mission, Texas. Mission EDC focuses on five areas: entrepreneurship and STEAM education, business expansion and retention, recruitment, infrastructure and transportation, and quality of life. 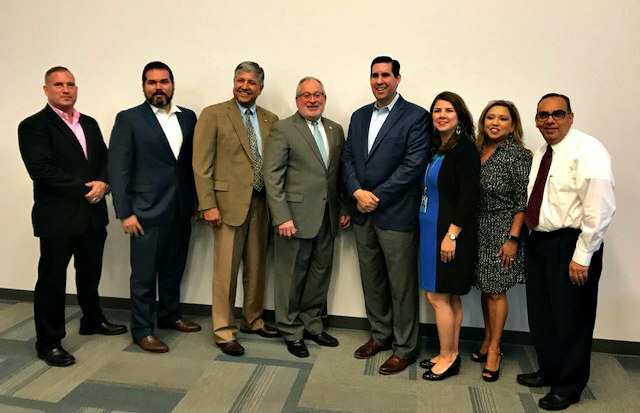 From left to right: Jody Tittle, MEDC Board Vice President; Daniel Silva, MEDC COO; Richard Hernandez, MEDC Board Secretary; Eduardo A. Campirano, Port Director & CEO; Alex Meade, MEDC CEO; Linda Requenez, MEDC Treasurer; Catherine Garcia, MEDC Board Member; Ruben Plata, MEDC Board Member and Mission City Councilman.